We are elated to know we can make a difference in the lives of little ones- EVEN if they live on the other side of the world! Dr Flores has made herself available for skype consultations with those that do not have access to specialists in the field of preventing and correcting flat head syndrome, aka positional plagiocephaly. She has consulted with parents all over the U.S. and other countries including Luxenberg, Saudi Arabia and now the Caymen Islands! Since her interview with CBS on Flat Head Syndrome and the release of her first book entitled ‘How to Avoid Flat Head & Delays in Baby’s First Year’, Dr Flores has proven to be one of the top experts on effective, safe and holistic techniques that prevent and correct malformed head shapes in infants while also improving upon the root cause of the head flattening. Physical Therapy Solutions deserves seven stars as far as we’re concerned! When my daughter was diagnosed by her paediatrician as having flat head syndrome I started combing the internet for information to educate us on what we could do to help her. This lead to finding a YouTube video in which Dr. Flores spoke about the issue. Noting her expertise from the video I looked up her practice and contacted them for an appointment. However, there was once slight issue…we are in the Cayman Islands and they are in Santa Monica California. I decided to get in touch anyway to see if we could do a computer video conference via Skype. I was elated when they confirmed that they indeed could work with us via Skype. The consultation was completed and with the advice and exercises suggested by Dr. Flores, our daughter is almost fully recovered from Flat Head Syndrome and Torticollis by our followup appointment just one month later. We are so thankful for Dr. Flores and her practice. Do not hesitate to contact them even if you’re on the other side of the world! To schedule a video session with Dr Flores, contact us directly from our website at babytherapysolutions.com or call us at 800-507-2634. We are here to help! December 29, 2016. Tags: congenital muscular torticollis, flat head syndrome, Pediatric Physical Therapy, plagiocephaly. Early Head Start, Events, FYI's for New Parents, Invitations, Testimonials. Leave a comment. Results of our August Fundraiser: Thank you Thank you from the bottom of our Hearts! The outpour of love and generosity was more than we expected during our August fundraiser for sweet baby Eddie. His Mother was shocked and elated to hear the great news when we called to tell her how much we were able to raise! The funds raised will go toward supporting Eddie’s healing process. A check was made out to him and mailed to him today! View this video for a special message from Eddie’s Mom to those who donated. September 6, 2013. 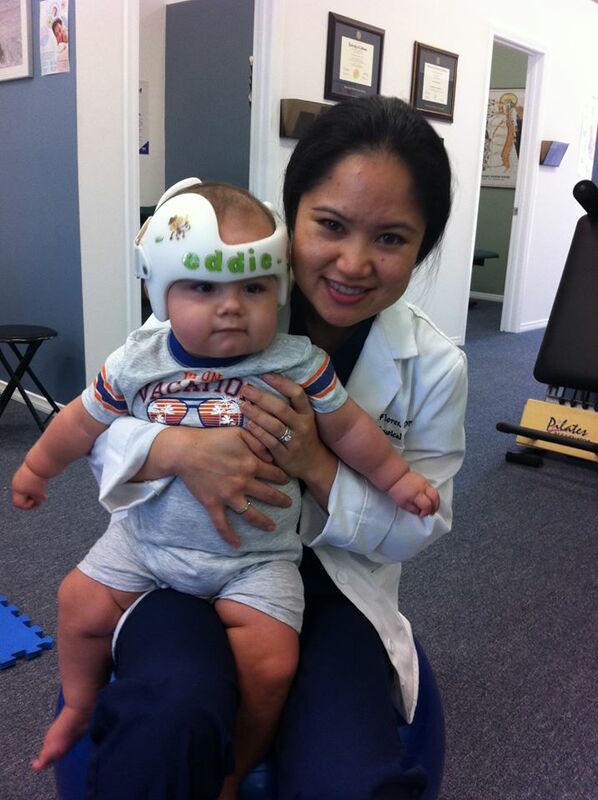 Tags: Dr. Yvette Flores, Pediatric Physical Therapy, plagiocephaly, prayforsweeteddie, ptsolutionsla.com, Torticollis. Events. 1 comment. August 5, 2013. Tags: prayforsweeteddie, ptsolutionsla.com. Events, Newsletter Spotlights. Leave a comment. May 1, 2013. Tags: babytherapysolutions, congenital muscular torticollis, Dr. Yvette Flores, flat head, flat head syndrome, head flattening, infant torticollis, Pediatric Physical Therapy, plagiocephaly, Torticollis. Early Head Start, Events, FYI's for New Parents, Welcome New Parents!. Leave a comment. Thank you to the Parents, Patients & Santa Monica Affiliates for your Generosity! February 7, 2013. Tags: CASA charity, children's charity, donations, physical therapy solutions, ptsolutionsla.com. Events. Leave a comment. 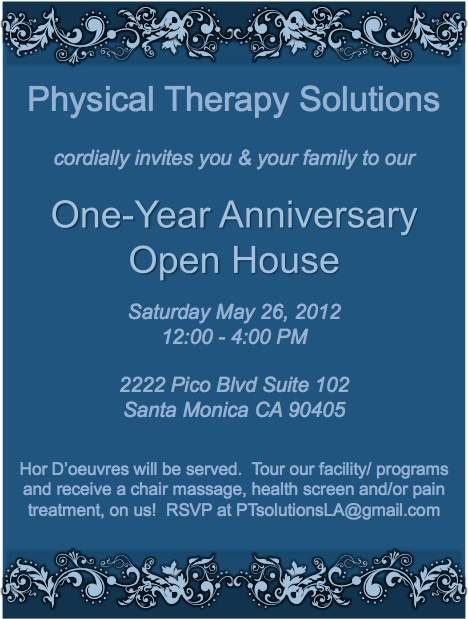 We have been blessed to have an amazing 1st Year at our Pico Location…. It’s time to Celebrate!!! May 14, 2012. Tags: chair massage, fitness, health screen, physical therapy, weight loss. Events. Leave a comment.